Artaud's influence on the Beats was based on more than simple admiration for his lunatic-saint persona. Two titles by him are mentioned in the Celestial Homework, Ginsberg's recommended reading list: Van Gogh: The Man Suicided by Society and To Have Done with the Judgement of God. The first is a long, long poem/essay arguing that it was the world that was abnormal and not Van Gogh ("who, in the course of his whole life, cooked only one hand and did no more, as for the rest, than slice off his left ear only once"). Society created psychiatry to defend itself against lucid minds like his that see its basic injustice. At the moment of his death, it was the general consciousness of society that entered Van Gogh and "suicided" him precisely because he had managed to temporarily tear himself away from it. No, Van Gogh was not mad, but his paintings were flame-throwers, atomic bombs, whose angle of vision, compared to all the other painting that was going strong at the time, would have been capable of seriously disturbing the larval conformism of the Second Empire bourgeoisie and the myrmidons of Thiers, Gambetta, Félix Faure, as well as those of Napoleon the Third. It is a disconcerting piece, with its rapid transitions from hyperbolic condemnations of society to anti-psychiatry rants that read very personal and more than a little paranoid (not surprising, given Artaud's history) to analyses of Van Gogh's paintings and denunciations of cosmic evil. It is, as people usually say about things they don't entirely understand, an experience. You have to read it once, though, because there are beautiful passages in it, and I say this as someone who was very skeptical about it at first. In any case, it's easy to see what in this poem could speak to the Beat Generation. Ginsberg's vision of Moloch seems especially close to Artaud's mad, evil world. While sharp, the social critique is just part of what might have influenced the Beats or otherwise resonated with them. There is another aspect that is really important and that I'll talk about in the next (and last!) section of this post: Artaud's intonation. To make metaphysics out of a spoken language is to make the language express what it does not ordinarily express: to make use of it in anew, exceptional, and unaccustomed fashion; to reveal its possibilities for producing physical shock; to divide and distribute it actively in space; to deal with intonations in an absolutely concrete manner, restoring their power to shatter as well as really to manifest something; to turn against language and its basely utilitarian, one could say alimentary, sources, against its trapped-beast origins; and finally, to consider language as the form of Incantation. 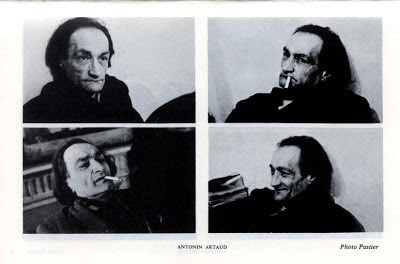 Artaud firmly believed in the importance of prosody, of patterns of stress and intonation. For him, the role of these patterns extended beyond creating an esthetic effect or transmitting a message parallel to that of the text itself. Its rhythm is what gives a text the possibility of influencing the mind and of allowing it to escape reality, perhaps even to communicate with the transcendent. If you listen to To Have Done with the Judgement of God, you'll see that Artaud has a very distinctive, and weirdly cadenced, despite its exaggerations, style of reciting. He also puts his entire being into the performance. This, of course, brings to mind Ginsberg and his famous readings of Howl. We know that he must have been aware of Artaud's style, because Carl Solomon, the guy to whom he dedicated Howl, had seen Artaud reading Van Gogh: The Man Suicided by Society in 1947 and expressed his enthusiasm to Ginsberg. And Artaud's theoretical pronouncements, like the one above, could have also influenced Ginsberg's style of reciting. (It's unclear exactly when Ginsberg first had access to The Theatre and Its Double.) In any case, his readings seem to come really close to Artaud's ideals of what performed language can achieve and the effect it can have on the public. There is this very nice description of Ginsberg' first reading of Howl as giving the impression that "a human voice and body had been hurled against the harsh wall of America and its supporting armies and navies and academies and institutions and ownership systems and power-support bases." and because he never gives us a chance to talk. Bonus: A recording from an Allen Ginsberg and Jerome Rothenberg class on the voice. You can hear them talk about Artaud, play a recording of him and actually recite the two poems I mentioned. Also, for Ginsberg on Artaud, make sure to check out this wonderful series of posts on The Allen Ginsberg Project. Glad you enjoyed it :) I read Theatre and Its Double too. It was a frustrating read for me, a lot of ups-and-downs. I might write a post on it soon, to recap it for myself mostly.